Desperate times call for desperate measures, and grocery shopping for a fresh salad recipe and photo shoot four hours before THE east coast blizzard of 2015 was a desperate time. At least there’s no shortage of entertainment for me. As long as there’s power, all I have to do is turn on the local weather and chuckle about the relative definitions of treacherous winter conditions between Minnesota, where we know it’s possible (and likely) that there will be more than one blizzard a year, and the east coast, where a 30% chance of snow in the forecast causes hysteria and grocery store sellouts of milk, bread, bananas, and kale. Not the items I chose at the possibility of being stranded in my home for two days. So excuse me if my baby arugula looks a bit sad–it was my only option by the time I got to the third store. 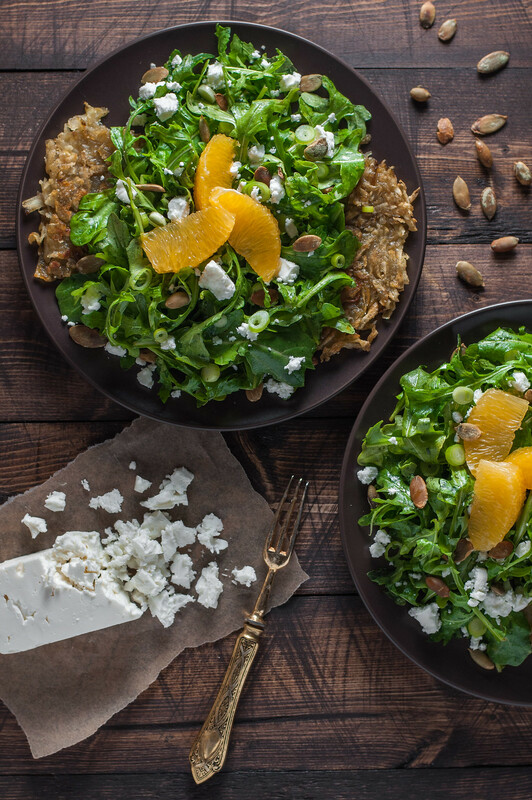 The first time I made the salad, it was with “regular” (non-baby) arugula, and I much prefer the strong peppery flavor with the sweetness of orange and the mellow, creamy feta. The citrus, by contrast, was well stocked and at its peak. With all the reading I’m doing (currently this), it’s a miracle I haven’t restricted myself to eating only food I can grow on my small balcony or find at the farmer’s market, but the plain old navel oranges I got from Trader Joe’s were so juicy and sweet. In all honesty, more than a few on one salad overwhelms the photo a bit, but I threw on extra when I devoured both of these salads for dinner moments later (the plates are smaller than they look? ), and I suggest you do the same while things are in season. I can’t really explain the evolution of this salad. It’s not entirely Asian, not entirely wintery, and, as a result, it was very difficult to name. The first go ’round of it was very much a composition of ingredients I had on hand, with the scallions added later as the answer to the onion flavor I craved without extreme pungency. 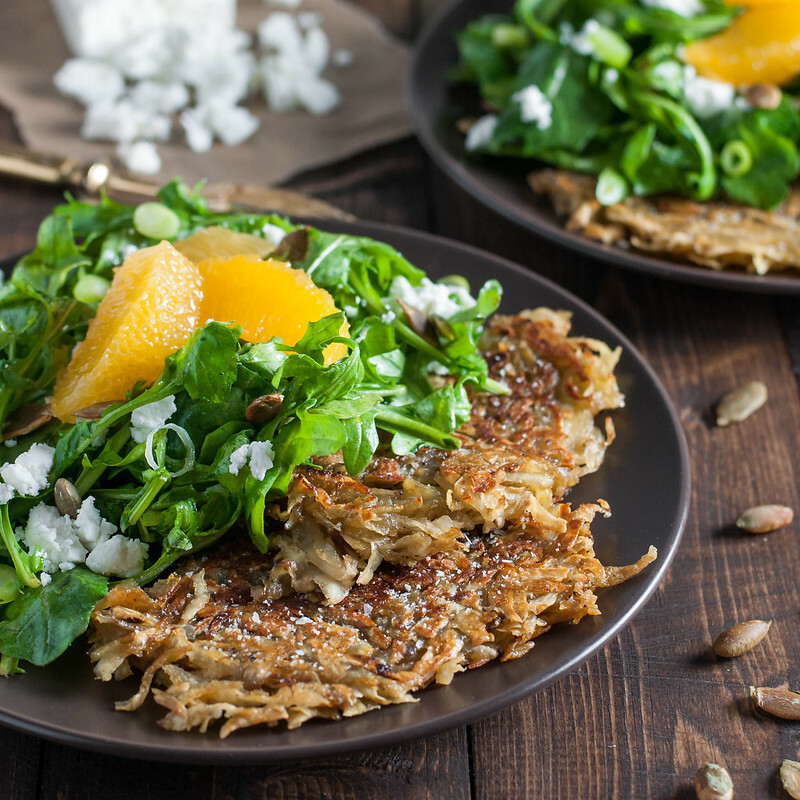 With all the gratins I’ve been making lately, starter and side salads have been big around here, but the addition of simple, salty sweet potato cakes contributes enough bulk to make this one a light meal. And yes, those are sweet potatoes in the photo. By the last grocery store before the storm, I was in a hurry to get home before my fellow drivers got really crazy. 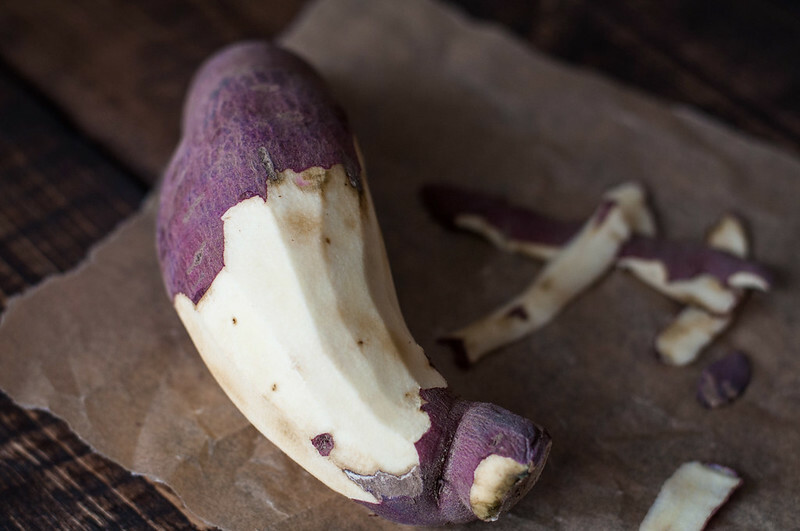 So, I saw purple skin, and I saw the words “sweet potato”, and I grabbed. And then, when I peeled, I found…white! Not what I expected, which was the purple flesh you get from purple baking potatoes. Regardless of color, the cakes are soft and filling and perfect sprinkled with a pinch of salt, just one more textural element to the whole dish. They take about a half hour to fry at a speed which allows them to brown perfectly and cook through completely, but all the other salad prep can be done during that cook time. For those of you that may have had some unpleasant weather this week, hopefully you can get out of the house for some fresh produce and break free of all that milk and bread you’ve been eating. I have plans to continue the doughnut trials in search of the perfect long john recipe. Finally, just to check in and make sure she’s reading–HAPPY BIRTHDAY MOM!!! I hated fruity salads--until this one. 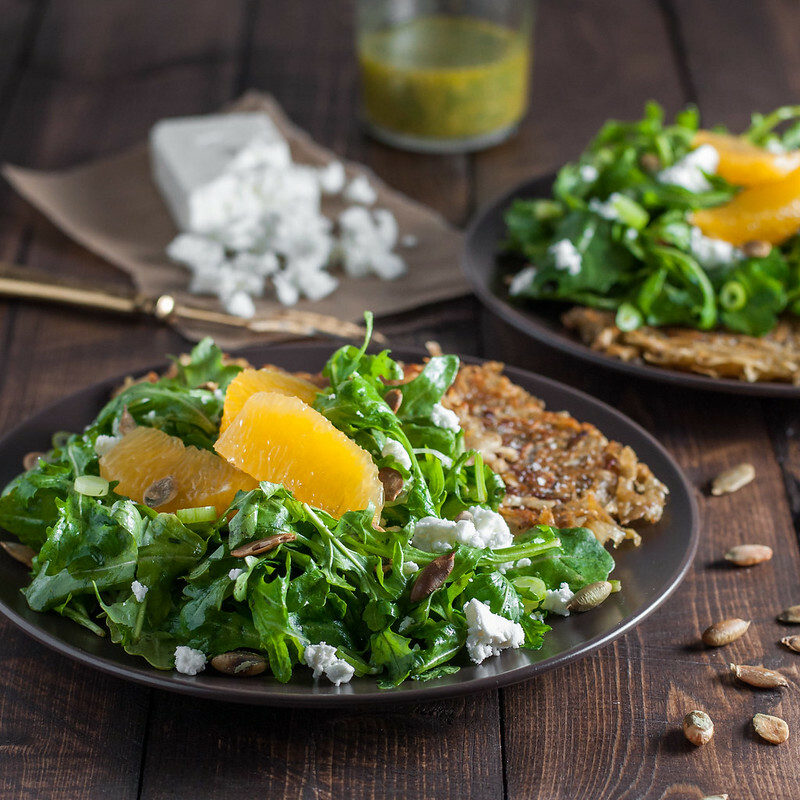 Peppery arugula, salty feta, and crunchy pumpkin seeds balance the sweetness of juicy, peak season citrus so dinner doesn't taste like candy. If you need to toast the pumpkin seeds, preheat oven to 350 degrees (F). Spread seeds in a single layer on a rimmed baking sheet. Toast for 5 to 10 minutes, watching carefully and stirring once, until some seeds turn golden. Remove to a towel to cool. You can also toast the seeds on the stove, in a dry skillet, over medium low. Stir frequently for 10 to 15 minutes, until golden. Grate potatoes on coarse side of a box grater or in a food processor (do not rinse). Toss with ½ teaspoon sea salt and ¼ teaspoon pepper. Heat a cast iron or nonstick skillet over medium. Add 1½ tablespoons olive oil once hot, and heat until shimmering and fluid. Add potatoes to pan and spread into a layer about 8 to 9 inches in diameter. Press potatoes down and together with the back of a spatula, reduce heat slightly, and cook 10 to 15 minutes while you make the vinaigrette. 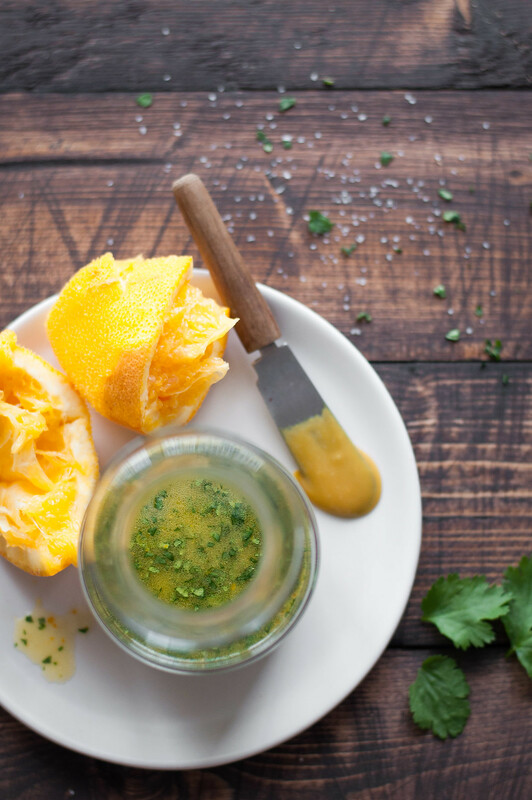 Whisk the mustard, orange zest and juice, vinegar, and cilantro in a small bowl or liquid measuring cup until combined. Whisk in sesame oil, followed by olive oil, until emulsified (blended until the oil and other liquids no longer separate). Season with ¼ teaspoon salt, taste dressing on a piece of arugula, and add seasoning to taste. Check the potatoes. When well browned on one side, use spatula to cut the round into four quarters and flip each over in the pan. Cook another 10 to 15 minutes, until browned, while you prepare remaining salad ingredients. 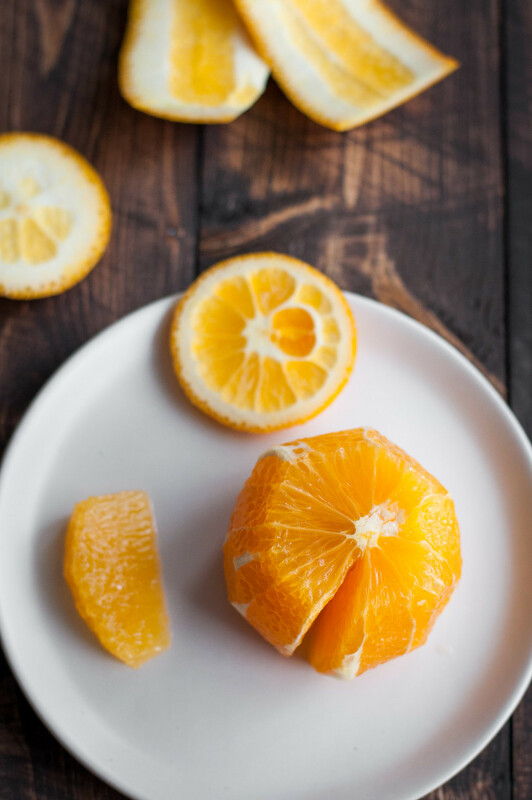 Use a small, sharp knife to cut both ends off the orange, removing the white pith but as little fruit as possible. Stand the orange on one end and use knife to remove peel and pith, from top to bottom. Holding the orange in one hand, make an incision on each side of each wedge, then pull out the loosened wedge, continuing to remove all the fruit. Combine arugula, half the feta, and scallions in a mixing bowl and toss with most of the dressing. When the sweet potato cakes are finished, drain on paper towels and sprinkle with sea salt. Put 2 wedges on each serving plate. Top potato cakes with salad mix. Top each salad with half the remaining feta, the pumpkin seeds, and orange wedges. If you need to toast the pumpkin seeds, make more than the amount called for in the recipe. It's easier to work with more, and they're great for oatmeal or snacking! 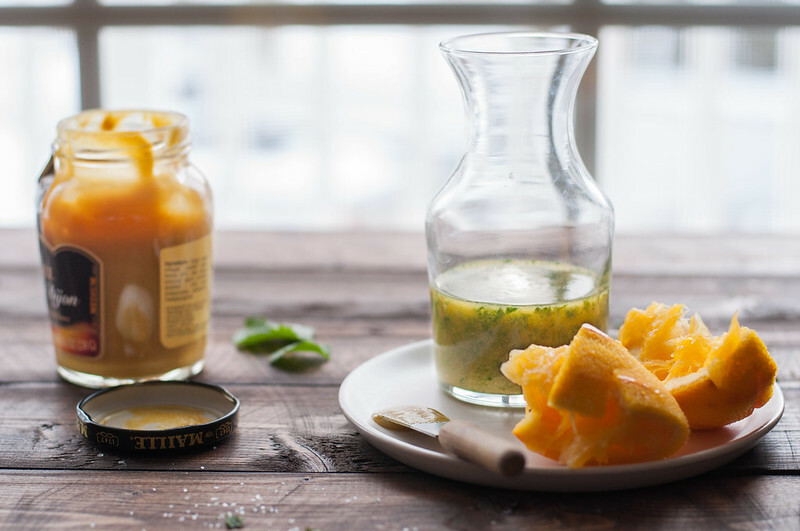 You may not need all the dressing (the recipe yields ⅓ cup). Store extra in the fridge in a sealed container, and bring close to room temperature before serving. To make the salad dairy free and vegan, omit cheese. Note: this page may contain affiliate links. It does NOT contain sponsored content. Affiliate links (to products I use, on Amazon) offset my food and website maintenance costs, so I can keep bringing you crazy salad recipes like this one. Thanks! 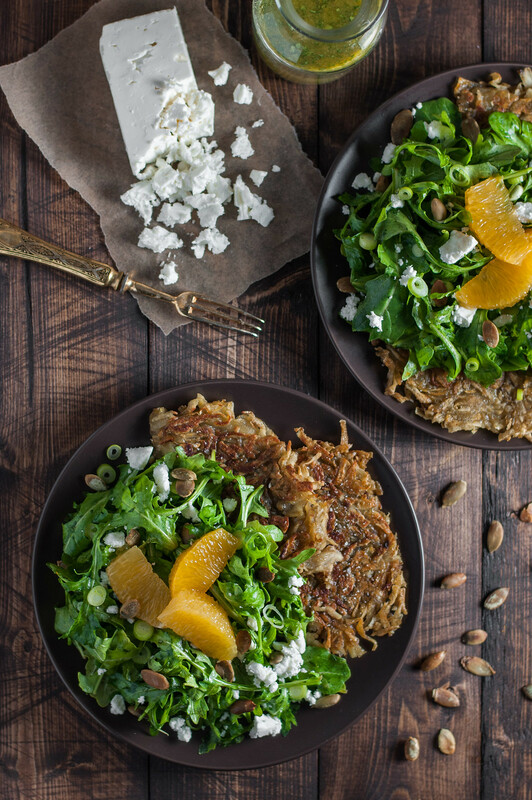 I am just loving everything about this salad – the fresh flavours, ingredients and those sweet potato latkes. 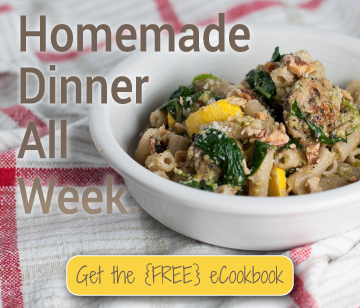 I must try the recipe, it looks perfect for a healthy dinner or light lunch.